H.E. Yahya bin Said bin Abdullah Al-Jabri, Chair of the Special Economic Zone Authority in Duqm (SEZAD), signed an agreement today (Thursday, 7 December 2017) with little India Company as a developer that plans to establish an integrated tourism complex in the Special Economic Zone in Duqm (SEZD). Pradeep Nair signed the agreement on behalf of little India Company in his capacity as its Chair in the presence of H.E. Indra Mani Pandey, the Indian ambassador to the Sultanate, and a number of officials, businesspeople and traders at the main building of Bank Muscat. The new tourism project includes a 5-star hotel, resorts, yacht marina, various commercial complexes and an integrated residential complex with beachfront villas and apartments. Its estimated investment cost is about USD 748 million, equivalent to OMR 288 million. SEZAD allocated about 600 thousand square meters for the project, which will be in the tourist area on Duqm coast and implemented in different stages according to the timetable approved by the parties. 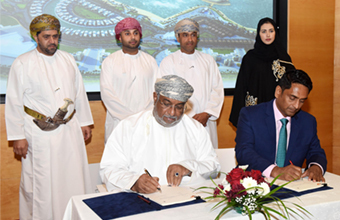 The ceremony also included the signing of the financing agreement between little India Company and Methaq Islamic Banking by Sulaiman bin Hamad Al-Harthy, Deputy Chief Executive Officer, Islamic Banking, Bank Muscat, on behalf of Methaq. Moreover, little India Company also signed an agreement to manage its 5-star hotel with the US Marriott Group, a real estate development MoU with Sanjay Puri Master Company, and an agreement with US EMG Digital Marketing Company. "The signing of the usufruct agreement for the new project is part of SEZAD efforts to attract quality projects and investments that provide a good addition to SEZD and contribute to enhancing economic diversification therein," said Ismail bin Ahmed Al- Balushi, Deputy CEO of SEZAD. He pointed out that with the growing interest in SEZAD, these projects will provide new opportunities for the development of Duqm and create job opportunities that correspond to the aspirations of the local community and surrounding areas. Al-Balushi indicated that the new project would contribute to support the tourism sector in SEZD, especially that the renowned Marriott International will manage the 5-star hotel.